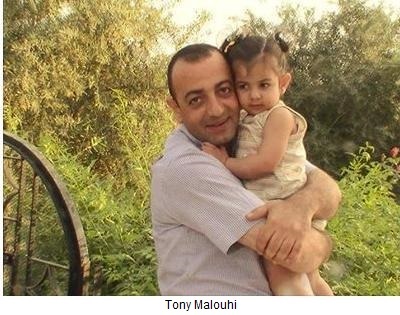 (AINA) -- Recently, Jihadi sources announced that Tony Malouhi, a Syrian Christian army officer who defected, was released from imprisonment by ISIS [al-Qaeda] after converting to Islam after having been threatened with execution by the group. A Twittermessage from a Jihadi source in Arabic said "So he [Tony] became the prisoner in ISIS' custody as rumors went out that ISIS had killed him until today with his release and conversion to Islam, and his name has become Mohammed Nour." Below is the back-story of his life translated from Arabic. The events of the revolution have urged all fronts by which one can intervene with the organization Islamic State of Iraq and ash-Sham, to prevent them from executing a renegade Christian officer [i.e. defector from the Assad regime] in Raqqa. Sources close to the officer told Aks Alser, that Captain Tony Michel Malouhi had defected and had handed over the district of Mansoura completely to the Free Army, and then he remained for 20 days in the village of 'Jawar al-Afs' in the province of Homs. The sources added that the regime had stormed the village and had placed him in Homs prison, then moved him to Tabqa military airport, then to prison security in Raqqa, before the Nasr Salaheddin brigade had taken him prisoner after the liberation of Raqqa. After a part of the Nasr Salaheddin brigade had pledged allegiance to ISIS, they proceeded to take 24 people prisoner, among them Tony Malouhi. The sources confirmed that he was due to be executed this morning (Friday, 20 September), in the village of Baruda in Mansura in Raqqa, but the operation was postponed till the evening in light of the fact that the story of Malouhi was nown among all activists and residents of the area in which Malouhi had been present. The concerned activists implored intervention with ISIS in an effort to rescue Malouhi who had himself announced his defection more than a month before the liberation of Raqqa.